Property Clearance Services in Chelsea Are Easy to Find! Have you been meaning to have property clearance, but haven't gotten around to it yet? There are a few reasons to do so! Maybe you're looking to renovate or redecorate your home in SW3 area – to either add a bit of flavour to your home, or to cater for a tenant or house mate. Or perhaps you feel you own too many pieces of furniture and possessions in general, and feel it's time to de-clutter. In either case, if you've been looking to remodel your home, garage, office space and so on, now is the best time to do it. Here at Rubbish Removal Chelsea, we provide property clearance services, so you can transform your living or working space without having to do the heavy lifting yourself. Furniture, appliances and all forms of clutter can be removed, recycled and otherwise disposed of without having to exert yourself, and thanks to our diligent staff, we promise to get the job done in as little time as possible. Our home clearance services can clear out just about any part of the home or work environment. We offer full on property clears, as well as loft clearance, garage clearance, office space tidy ups – you name it, we can clean it up. We also offer some of the most affordable clear-outs local to SW3 on top of this, so you don't need to worry about going over budget with your renovations. Every segment of our service is highly professional, because we understand the scale of the task at hand. From the moment you contact us, right through to the end of the process, we guarantee that things will get done properly. If you want more information on this and our other waste removal services, call us on 020 8396 7187 today! Just to put any of your worries to rest; we operate on an environmentally friendly basis, and are fully licensed to carry and transport waste. We can offer you additional liability insurance, so there is no chance that something goes wrong, you're protected. House clearance can be a tough thing to deal with, especially if you're having a proper clear out. We make sure to keep your personal sentiments in mind. Reusable items will also be put to good use – they will either be recycled, or passed on to somebody who needs it. So to summarise; we provide no nonsense property clearance services in Chelsea, and at a low price with no hidden fees. We can handle all sorts of clearing jobs - both our teams of staff (and our company in general) are well equipped for every type of clear out. From bulky furniture and appliances that need to be dislodged and removed, right through to the careful removal heavy duty machinery from your garage or shed, we've got what it takes! So if any of this interests you, then get in touch with us today. 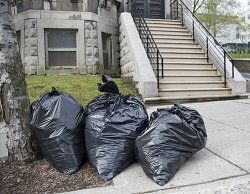 Our rubbish removal services are simple to hire, and can be easily scheduled around your current commitments. Clearing out a SW10 based property for renovation or any other purpose is a tough job, but thanks to Rubbish Removal Chelsea you don't have to worry about it! Our number is 020 8396 7187, and by calling it, you will be put through to our friendly call centre staff, who will help get things started on the right foot.